Khwopa College of Engineering is Nepal 's first community-based engineering colleges, undertaken by Bhaktapur Municipality. It is centrally located at culturally rich city Bhaktapur. Khwopa College of Engineering will, in every regard, be the right destination for those who aspire to become professional engineers and architects at affordable fee. With a distant vision of maintaining Bhaktapur 's hard-won glory, these colleges aim to produce highly skilled engineers/architects that will have blends of both indigenous and modern-day technologies. Produce competitive and efficient Engineers. Khwopa College of Engineering administration, Management and Faculty are putting up their best to achieve the objectives and goals. The spirit of working together in a closely knit atmosphere has definitely shown remarkable achievements in the past days. Student must fill up online entrance form.He/She will be selected according to their rank in IOE exam. After selection he/ she must attend the college interview. After students are approved from interview, Firstly he/she can visit college reception to know about the requirements for admission, fee structures and documents required etc. 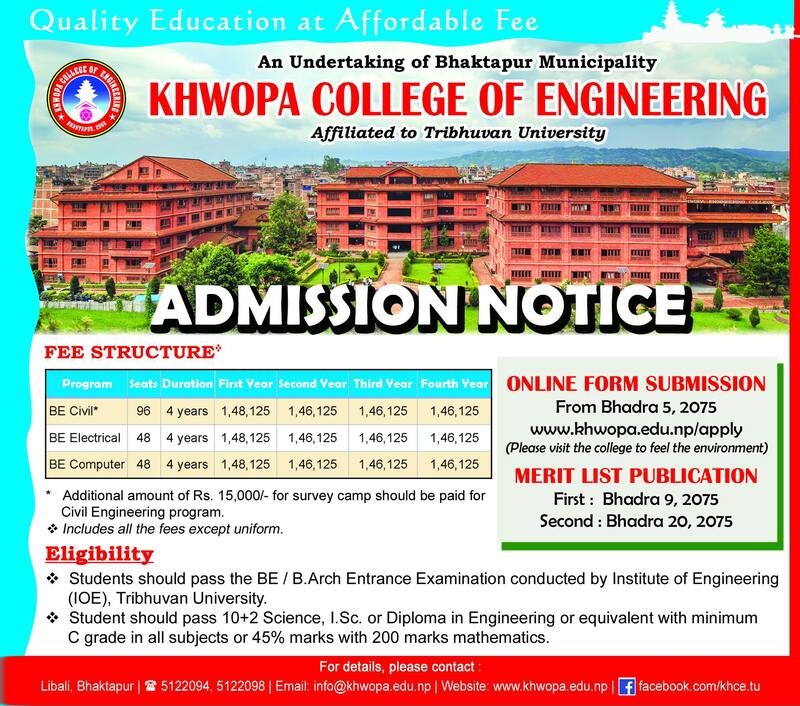 Khwopa College of Engineering provides full scholarship for the applicants of each program with minimum 75% in +2 science or I.Sc., or Diploma in engineering and scoring the highest marks in the entrance exam.Scholarship may be granted to economically needy, diligent and disciplined student. On the basis of the marks secured in semester examination, college will provide scholarships of 100%, 50% and 25%.